Bài học Speak Unit 3 Lớp 8 - At home hướng dẫn các em nói và mô tả về vị trí của các đồ vật trong gia đình. - The table is in the middle of the kitchen. - The flowers are on the table. - The plate is on the table near the flowers. - The clock is on the wall above the refrigerator. - The cupboard is on the wall above the counter. - The are some knives on the wall under the cupboard. - The rice cooker is on the counter near the dish rack. - The bowl of fruit is on the counter next to the disk rack. - The calendar is on the wall above the sink. - The sink is next to the stove. 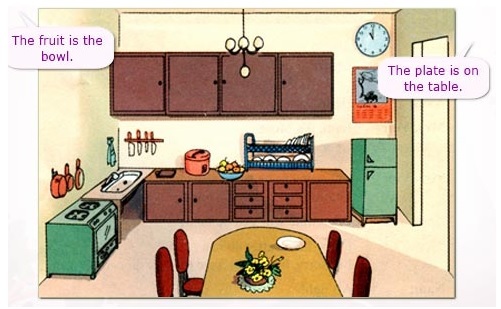 - The saucepans and the frying pan are above the stove and the sink. A: Let's put the couch against the wall. B: OK. I think we ought to put the armchair opposite the couch. 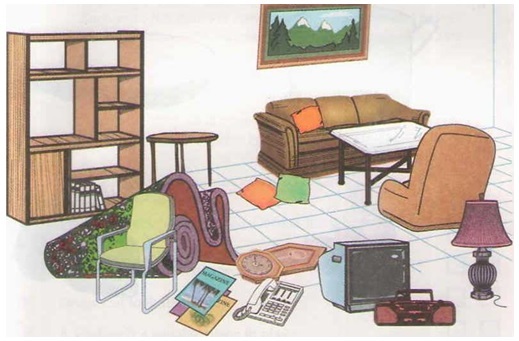 A: OK. And think we ought to put the coffee table in front of the armchair and the couch. How about the rug? B: I think we ought to put it on the floor under the coffee table. A: Good idea! Let's hang the picture on the wall above the couch. B: OK. And I think we ought to put the lamp in the corner next to the couch. A: How about the shelves? B: I think the shelves ought to be on the wall opposite the couch. A: Great! And I think the TV and the stereo should be on the opposite wall across from the shelves. B: Let's hang the clock on the wall to left of the picture. A: I think we should hang it on the wall above the shelves. B: OK. Let's put the telephone on one of the shelves. How about the cushions? A: I think we should put them on the couch. B: Let's put the magazines on the coffee table. Trên đây là nội dung bài học Speak Unit 3 Tiếng Anh 8 hướng dẫn các em mô tả vị trí đồ vật, trong quá trình học bài và thực hành có điểm nào chưa hiểu các em có thể đặt câu hỏi trong mục Hỏi đáp để được sự hỗ trợ từ cộng động HỌC247. Chúc các em học tốt!